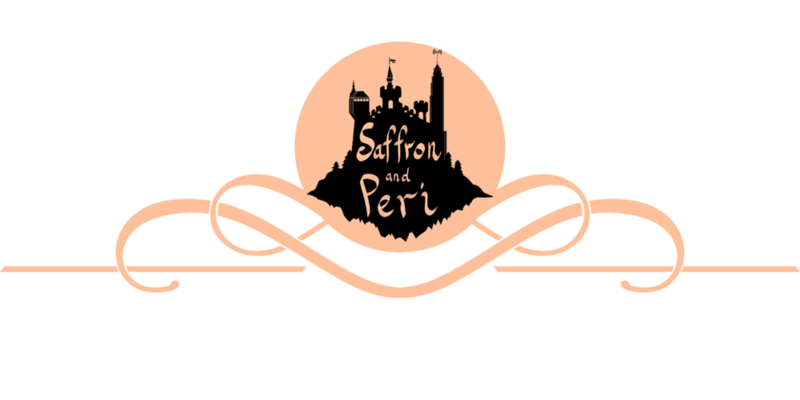 Jenan: Hi everyone, thank you for listening to season 3 of Saffron and Peri. Sara: It was a weird genre bending season, but we hope you liked it. Jenan: As always, here’s a bonus episode, and also as always, bonus episodes take place outside of the current Saffron and Peri timeline. Sara: But if you want to know what the heck Star Crossers is, then listening to season 3 helps. Narrator: Last time on Star Crossers, the nefarious Duke Edgar viciously murdered King Hugo with a Black Hole Cannon, plunging a bereft Queen Nebula into a deep melancholy. Meanwhile, the exiled Princess Aurora knows nothing of her father’s death, as she is still on the run with her love, the amnesiac cyborg Sir Horizon, who is trying desperately to solve the mystery of his father’s identity. Aurora: Look Horizon, isn’t the astral sunset beautiful. Horizon: Yes, but everything is beautiful when you’re around. I could be in the middle of the Pustulon 5 Landfills and it would still feel beautiful with you at my side. Aurora: Oh Horizon! I hope you’re not planning to make that our next date. Oh no, you are, aren’t you? Horizon: I’m afraid so my love. Aurora: But why would we unless *gasp* unless you have another lead on your father! Horizon: Aurora, my dearest, this could be yet another dead end! Aurora: Horizon, stop, I promised to search the stars with you and I mean it. No matter how far, no matter how long, no matter how smelly. Ship Computer: (full robot monotone) Sir Horizon. Princess Aurora. Broadcast from the capital. The King’s Coronation will take place at the setting of the third sun three days from now. Aurora: New King? Did something happen to my father? Ship Computer: It has been reported that the late king had a tragic accident while cleaning his black hole cannon. Aurora: My father would never go near a black hole cannon! He always complains that the booms make his ears pop. It must be the work of my nefarious uncle, Duke Edgar! He always resented my father’s crown. Oh Horizon, he would never have done this if I were still in line for the throne. Horizon: Aurora, we couldn’t have predicted that it would come to this. Who knew that your parents would send the planet’s entire army after us just because I asked you to the space prom? The important thing now is to return immediately and rescue your planet from Duke Edgar. Aurora: No Horizon, we’d be arrested on sight. At least I would. They’d probably just kill you. And murder me later at a quieter location and a more convenient time. And besides, what about the lead on your father? We mustn’t let it go cold! Horizon: No time to argue, Aurora. Ship, take us to our home planet! Narrator: And now, a short message from our sponsors. Saffron: Isn’t Aurora’s dress gorgeous! Peri: Yeah, the costume designers on this show are really good. But um, how does someone on the run have all these clothes? Saffron: Per, don’t over think it. Peri: But she didn’t take any clothes when she left her kingdom, right? She only had that small jewelry box that contained the secret message from her long lost older sister Polaris. And there are wanted posters of her all over the galaxy, so it’s not like she could casually stroll into a boutique or anything. Peri: Alright, alright, I’ll shut up. Narrator: And now, back to Star crossers. Peri: Wait, ANOTHER costume change? Saffron: Peri, I WILL strangle you unless you shut up. Peri: Sorry, sorry. I’ll be quiet. Horizon: Hurry Aurora, I know of a secret entrance to the castle from my days as a palace guard. Aurora: Remember how you would leave space camellias beneath my window every morning? Horizon: How could I ever forget? Aurora: Well Horizon, you did forget a great deal about the part of our relationship that happened before the accident that gave you your amnesia. Horizon: Well then, nothing short of a gravitational bomb hitting the warship where I was stationed would make me forget. This way. Aurora: I had no idea there were all these secret tunnels under the castle. How old are they? Who built them? How far down do they go? Horizon: All valid questions my love, but questions for another time. Horizon: I don’t see anything. Aurora: How could you not see it? It’s right in front of you, clear as the Borealis skies. Horizon: I… I just see a blank wall. Aurora: Something’s not right. Horizon, we must investigate. Take my hand and follow me. Horizon: Follow you straight into a wall? Aurora: You once said that you would follow me into a supernova. Horizon: And I would. Lead the way. Horizon: What do you see? Aurora: Computers. Screens. What do you see? Horizon: Nothing. Nothing at all. Aurora: Horizon, do you think that whoever programmed your cyborg eyes could have programmed you to be blind to all of this? Horizon: But why would anyone work in such secrecy? Dr. Locus: For no other reason than to protect you dear boy. Horizon: Dr. Locus? Is that you? I still can’t see anything. Dr. Locus: Perhaps it’s time to lift the veil of secrecy… cyborg eye cease cloaking. Horizon: This lab… I’ve been here before. Dr. Locus: Indeed you have, Horizon. Aurora: We demand answers Dr. Locus! Dr. Locus: Everything you need to know is in the master database. Horizon: Computer, who is my father? Narrator: And now for even more messages from our sponsors. Please buy their stuff! Peri: Okay, I have a theory! Saffron: Peri, stop. You always spout out ten ridiculous theories, and when one of them turns out to be true, you turn into a smarmy know-it-all for days. Saffron: Shhh, it’s starting again. Horizon: Now we’ll finally know the identity of my real father. Aurora: But that’s you! Horizon, he looks exactly like you. Horizon: I don’t understand. No one resembles a parent that much. Am I a clone? Dr. Locus: No horizon, you are not a clone. Aurora: Then… this person on the screen was his father? Horizon: Then who is my father? Tell me! Dr. Locus: I suppose you can say that I am your father. Dr. Locus: The real Horizon died on that fateful night, five years ago. He never made it out of the explosion. Horizon: No… that can’t be… I’m standing right here! Dr. Locus: You are not a cyborg Horizon. You are the epitome of all my years of research and experimentation. You are a robot designed exactly in Horizon’s likeness, absolutely inseparable from the original. Horizon: Are you saying… that I’m not human? That I’m not even alive? Aurora: Are you saying I’ve been dating a five year old?! Horizon: But why Dr. Locus… why? Why let me live out a lie for five years? Dr. Locus: Live? You’re not even properly alive my boy. And if I told you, it would have jeopardized the testing phase. Aurora: Testing phase? What do you mean testing phase? Dr. Locus: You! You Princess Aurora are the testing phase. I needed to ensure that my creations can fool even the people their models were closest to! So when the time came…. Well, perhaps it is best just to show you. Aurora: Is that… is that my long lost older sister Polaris? Dr. Locus: No Aurora, that is the robot that’s going to reclaim your sister’s rightful place in line, and be my puppet, so that I may rule over the entire planet! Aurora: You can’t do this! Dr. Locus: Would you rather your uncle, Duke Edgar, rule? Or perhaps you’d be willing to sacrifice all you hold dear and risk assassination to take the throne yourself? Aurora: I only know that I can’t let you get away with this. Dr. Locus: Oh, but I already have. I’ve been getting away with it for five years and you never once suspected that your love was completely artificial. Polaris, seize her. Aurora: Polaris, no! You can’t do this, I’m your sister. Polaris: No. You are not. Cooperate, and I will make this as painless as possible. Horizon: I won’t let you get near her! Dr. Locus: Horizon! Step aside. Dr. Locus: Be reasonable, Horizon. You do not love this girl; you were only programmed to think you do. Return to your place at my side, and I’ll remove that bothersome section of code lodged away in your intelligence chip. Horizon: You stay away from me! Dr. Locus: Akh, I was hoping it wouldn’t come to this. Initiate existential breakdown sequence. Aurora: Horizon! I mean, Robo-Horizon! Polaris: Surrender at once… “sister”. Narrator: Will Polaris’s robot clone defeat our heroes? Will Duke Edgar be crowned King? Or will Dr. Locus’s evil scheme to seize the throne succeed? Find out next time on the next thrilling installment of Star Crossers! But first, stay tuned after the break for scenes from next week’s episode. Saffron: More importantly, do you think Aurora’s gonna keep dating the robot? Saffron: I think she should go for it, cuz it’s a really cute robot. Peri: The teaser is starting, let’s see if it has any clues! Polaris: Aurora, it’s me! The real me! I faked my own death five years ago when I was investigating Dr. Locus’s mysterious experiments. Aurora: Could it really be you, dear sister? Polaris: Hurry, before Dr. Locus discovers the remains of Robo Polaris in his sock drawer! Horizon: Wait Aurora, let’s not be too quick to trust her. Aurora: You talk of trust? You’ve been lying to be for five years! Narrator: A battle for the fate of the planet…. Queen Nebula: Or what? Or else they’ll be more “accidents” with the black hole cannons? Step aside you fratricidal snake! Duke Edgar: You can’t prove anything! Queen Nebula: My two daughters at my side at last! But if you’re still alive, then can I hold out hope that my dear Hugo somehow escaped the black hole cannon? Polaris: No, I’m pretty sure he’s dead. Polaris: Look, he was a terrible king and an awful father. He made discriminatory laws against cyborgs even though his daughter was in love with one! Queen Nebula: Young lady, I will not have you badmouthing your father’s legacy! Polaris: But mooooom, I’m trying fight for social reform! Queen Nebula: No buts young lady! I don’t care if you’re a long lost heir and a leader of a covert coup d’état, you’re not too old for me to ground you! Polaris: Mother! Not in front of the resistance! Horizon: Aurora, I know that I don’t have a heart, but there is something in me that calls your name a thousand times a second. Aurora: How can you ask me to love you when I don’t know what you are? You don’t even know who you are! Horizon: I may not be Horizon, but I am the man that loves Aurora of House Borealis. Can’t that be enough? Aurora: I… I don’t know. What do you think Computer? Ship Computer: You should take the course of action that will lead to your happiness, Princess. Aurora: So wise. Maybe we shouldn’t have stopped that robot uprising last year. Narrator: Don’t miss the next exciting installment of… Star Crossers. Peri: Ha! I knew it! Polaris is alive! I’m the riddle solving champion! Saffron: This is going to be a long week. Jenan: And that’s it for our bonus episode. Sara: But wait, what happens next on Star Crossers? Jenan: Polaris teams up with Queen Nebula, Princess Aurora and Robo Horizon to defeat Edgar, then Polaris takes her rightful place as Queen, and then changes their planet’s anti-cyborg/royals relationship laws so that her sister can be with Horizon. And Saffron is totally right about Peri being insufferable about guessing the surprise ending. Sara: But wait, if Aurora ends up with Robo Horizon and they’re not wanted anymore, then that means they’re not Star Crossed. What do they do for the next season? Jenan: In the next season, Aurora and Robo Horizon spend their honeymoon by going on a space road trip to several charming little planets where murders suddenly take place, and in each episode, they investigate the murders and catch the killer, while unraveling a much larger conspiracy. Sara: Bold move on the show’s part. Jenan: Yeah, but it turns out to be a very popular season, and then the spunky reporter who follows them around wondering why murders happen on every planet they land on, gets her own spin off, and then there’s a bunch of crossover episodes, and then some movies, and then a Star Crossers Cinematic Universe. Sara: Cool. See you next time listeners!